Now you can help ensure the “Future of Fishing” while you’re raising money for your school, organization or business. 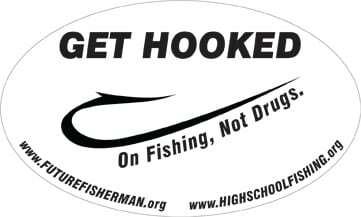 Use the suggested selling price of $2.99 and your organization can practically double its money while sharing the Foundation message of getting students involved in the family fun sport of fishing. Businesses also can benefit by putting these stickers on display at their checkout counters. Proceeds from this program help the Future Fisherman Foundation continue it’s youth education by funding grant programs. To order, use one of the options below. You can pay online via Paypal, by check or fax a school PO. If you would like to pay by Check, we will mail your stickers once payment is received. If you are faxing a School PO, we will mail stickers immediately. Shipping is free on all orders. For every 50 you order, you will receive free stickers. See the options below.